This week we have the amazing R. J. Anderson. She is known to her friends as Rebecca, is the daughter of a Bible teacher, the wife of an agricultural biologist, and the mother of three energetic young boys. 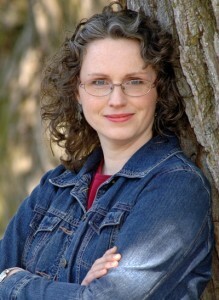 At five she was reading every fairy tale and myth she could get her hands on; at twelve she borrowed her parents’ electric typewriter and began hammering out stories of her own; and at nineteen she finished her first fantasy novel — but it was almost two more decades before she signed her first book contract. There is a lesson about persistence in this somewhere: but unfortunately Rebecca spent so many years feeling sorry for herself while her manuscripts languished in a drawer that she is almost certainly the wrong person to teach it! It will also available in the UK as KNIFE in January 2009. My agent had drummed up enough advance interest that he felt confident about taking the book to auction — I trusted his judgment, but I could hardly believe that such a thing would happen to me and my little book! When HarperCollins stepped up with an offer for a two-book deal I was overwhelmed, and as soon as the deal was confirmed I posted an all-caps, red-letter SQUEE on my LiveJournal and then phoned everyone I could think of to share the good news. My husband took me out for Indian food to celebrate, and a friend sent flowers — I floated on a cloud of happiness for days. It still seems unreal somehow, even now that I’m going through the process of revisions and talking to my editor on a regular basis. Part of me still thinks that there must have been some mistake and that I’m bound to wake up eventually. I don’t feel any different in a lot of ways than I did a year ago when I feared I would never be published — I still question and doubt myself often, and I still don’t feel like a “real writer”. But when I stop and think back, I’m enormously excited by how far I’ve come on the road to realizing my dream — to see my book in print and on the shelves for others to read. It was a much longer and rockier road than it needed to be, I think. I finished the novel in 1994, but quickly got discouraged by the long waiting times in the slushpile (one publisher took three and a half years to reject my manuscript) and gave up after only a couple of rejections. I spent the next few years writing fan fiction and posting it to the Internet for feedback, which had its own rewards — I managed to put together a great bunch of critique partners that way, and accumulated some loyal readers. But I should have gone on writing and submitting original work during that time as well, and I didn’t. It was 2002 before I decided to stop licking my wounds and try submitting again, and soon I started getting professional advice from editors and agents that brought my work up to a whole new level. I realized then how foolish I’d been to give up on my novels as early as I did… but you know what they say about hindsight! Last year I received a rejection from an agent I’d really been hoping to work with, saying that she’d read my novel but didn’t warm to my characters at all. Nothing terribly harsh about that, but since I’d always thought of myself as a strong character writer, it came as a serious blow. When shortly afterward I received several more rejections from other agents just based on the query (writing good query letters is an art in itself, and one I have yet to master), I hit rock bottom. I’m not normally an emotional person, but in mid-April of last year I lay on my office floor sobbing, bitterly convinced that I’d been deceiving myself all this time and that I would never, ever be published… but less than a month later, I had an agent and six weeks after that, a two-book contract. You just never know. On the positive side, once I was agented the rejections became much nicer. One editor said that while he didn’t think my book was right for his house, my prose was “so darn smooth!” and that I was “every editor’s dream”. I’ll treasure that rejection forever! 13 years, but for eight of those years it was just sitting on my hard drive while I moped. I let my work sit for years at a time whenever I got discouraged (which was pretty much whenever I got a rejection). I still wonder how much sooner I might have been published if I hadn’t allowed myself to give up so easily. While staying home to raise my three young sons, I also did a bit of freelance graphic design. Quit to become a full-time writer. I’ve already dropped the graphic design work I was doing and cut back on some other commitments so that I can concentrate more on my writing. Right now I’m fretting over the sequel, which exists only in outline and a couple of sample chapters. I’m experiencing a creative dry spell at the moment, where writing feels like drudgery, and that’s discouraging. I worry that I won’t be able to make the story and characters in this second book come alive the way they should, and that I won’t finish it in time for my deadline (which at present is fourteen months away — but I’m a slow writer, so that isn’t nearly as much time as it might seem!). I had the benefit of going a couple of rounds of revision with an editor before I was under contract — she gave me some terrific detailed advice on how to deepen and clarify my manuscript, and the revisions I did for her were what enabled me to eventually sell the book (even if she didn’t end up being the editor who bought it). So when I got my seven-page letter and marked-up manuscript from my editor at HarperCollins, it didn’t come as quite the shock it might otherwise have! I rewrote a large portion of the book and knocked off 11,000 words in the process of addressing her comments and suggestions; she says that revision’s a definite improvement, but that we still have some tightening and clarifying to do. So I’m expecting another letter of the same length or perhaps even longer, and an even more marked-up manuscript for the second round. Still, I don’t think this revision will take as long as the last one — most of the big structural issues have been addressed. Besides, I enjoy revision: I find it a lot easier to take an existing book and make it better, than to boldly tackle that daunting first draft where no one has been before. My boys are still young, so I can only write when the toddler is sleeping or when all three children are in bed. Since I try to go to bed no later than 11 p.m., that gives me just three hours a day to write — and what I’ll do when my youngest stops napping, I can’t imagine. One neat trick I’ve discovered, however, is that I’m much more productive if I work on a laptop with no Internet connection. I used to waste a lot of time checking e-mail and browsing author forums when I should be writing — but no more! DON’T GIVE UP. Don’t let rejection, even photocopied form rejections that come after two years of languishing in the slushpile, get you down. Just keep writing, keep revising, keep sending your work out and eventually you’ll start getting the kind of personalized rejections that will really help you as a writer — if you’re willing to listen and respond well to criticism instead of resisting it or taking it personally. And I really believe that once you reach that stage, it won’t be long before you find the agent and/or the editor who’s right for you. “Delight yourself in the Lord, and He will give you the desires of your heart. Commit your way to the Lord, trust also in Him, and He will do it.” — Psalm 37:4,5. I don’t know about aspiring writers, but I really dislike the idea some people have that protagonists in children’s books are “role models” for the child reader and therefore need to be sinlessly perfect — as though children are too ignorant to tell the difference between a good example and a bad one, or to understand that just because a wrong action doesn’t result in immediate disaster doesn’t make it right or the smartest thing to do. I think a lot of times a child reader will learn more and think more deeply about a protagonist who makes a mistake or a questionable decision than they will about someone who does the obvious right thing straight away. Finally, Snoop wants to know: what favorite children’s book can you not stand to hear criticized? This concludes our interview with our latest amazing author, R.J. Anderson. 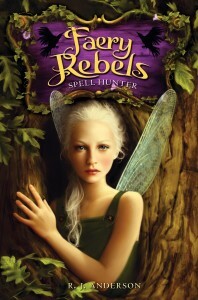 We wish her much success with her debut novel FAERY REBELS: SPELL HUNTER and the forthcoming books in the series. To see what R.J. Anderson is up to these days, visit her website at http://www.rj-anderson.com or her blog at http://rj-anderson.livejournal.com/. This entry was posted in Authors on the Verge and tagged debut author, debut novel, faeries, r.j. anderson, spell hunter. Bookmark the permalink. Thank you so much for interviewing me, Cynthea! You’re welcome! We loved having you! Wow! I loved this interview! She gave a lot of very insightful comments! It’s so fascinating to see that soon to be published authors have been down the same road we have! Way to go! And congratulations. I will have to pick up this book, my kids LOVE fairies! PS I love Narnia too!